The T-Bone Concerto is my very first composition for solo instrument and symphonic band. It consists of three movements called respectively ‘Rare’, ‘Medium’ and ‘Well Done’. This work was commissioned by The Kentucky Music Educators Association [KMEA] and was written between August 1995 and January 1996. 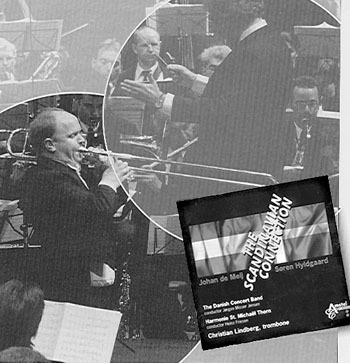 The first movement was given at the annual KMEA-conference in Louisville, Kentucky (February 1996), Jeffrey Thomas being the soloist. 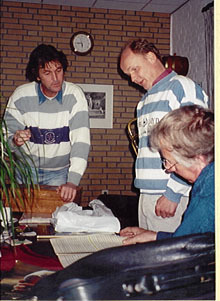 The world premiere of the complete work was performed by Jacques Mauger and the Band of the Royal Dutch Marines, conducted by Maurice Hamers, at the Concertgebouw Amsterdam on March 1st, 1996. In addition to the solo trombone, an important role has been allotted to a kind of chamber music ensemble within the band. This group introduces now and then new thematic material and accompanies the soloist, thus creating a nice transparant accompaniment. The ensemble consists of a double wind quintet (2 flutes, 2 oboes, 2 clarinets, 2 french horns and 2 bassoons) plus an english horn and a double bass. Parts I and II are written in the A-B-A form and allow the soloist to display both the technical and the lyrical characteristics of the instrument. Part III at first develops into a kind of neo-baroque style using the thematic material of the first and second movement, and finally leads to a triumphant finale and a virtuoso conclusion.